Max (Jason Bateman) and Annie (Rachel McAdams) are a hyper-competitive couple who first bonded over games and who now run a weekly ‘game night’ with their friends. When Max’s loathed and hugely successful brother Brooks (Kyle Chandler) offers to host one of the game nights, Max reluctant accepts. Brooks’ attempt at a murder-mystery role-playing game runs awry when he is kidnapped for real – and Max, Annie and their friends assume it is part of the game. The premise of Game Night, a 2018 comedy directed by John Francis Daley and Jonathan Goldstein, is actually a fairly decent one – although there is certainly a challenge in making such an unlikely turn of events believable. If you can move past the idea of somebody actually being kidnapped at the exact time they were faking it, there is a fair amount of subsequent comedy to be found. That comedy does struggle to maintain control, however, as the film slips further into some half-hearted action beats. The movie as a whole wobbles annoyingly. The jokes in between are worth the journey. Jason Bateman plays Max as his standard screen persona: effectively a fairly petty and bitter one, with an over-confident manner and a penchant for arrogance. He plays it about as well as he does in most of his other comedies, but to be honest it is a schtick that is wearing a little thin. Rachel McAdams feels more energetic and likeable, but her character is trapped a little too close to the generic ‘supportive wife/girlfriend’ trope that is fairly common to the genre. Together they make a slightly frustrating combination: better than the standard in Hollywood comedies of this style, but still too close to the archetypal tradition for comfort. They’re good, but you can sense they should be better. Their supporting cast are generally rather enjoyable. Irish actor Sharon Horgan feels particularly at ease as ring-in guest Sarah Darcy, while New Girl alumnus Lamorne Morris makes a welcome break onto the big screen. Jesse Plemons is wonderfully creepy as Max and Annie’s obsessive neighbour Gary. Plemons is an actor who has been turning up on American film and television with growing frequency; while he is yet to break out as a mainstream star, he is proving a valuable addition to a number of films. He is certainly one here, showing great comic timing and a fantastic deadpan delivery. 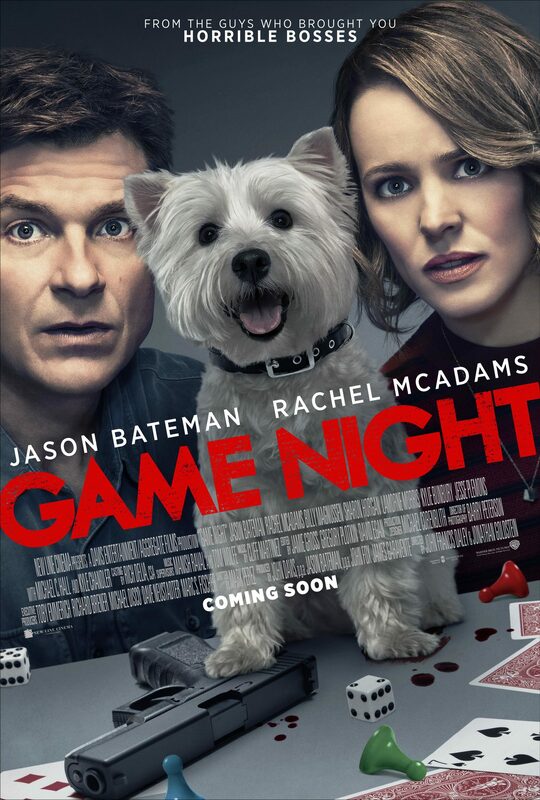 As far as studio-produced comedies go – this one comes from New Line Cinema – Game Night is certainly one of the decent ones, and is an amiable if occasionally scabrous experience. The only real disappointment comes from wishing the film was a little bit faster in pace, and an amount sharper in tone and delivery. It is definitely a good film. It arguably could have been better. Enjoy it with measured expectations.